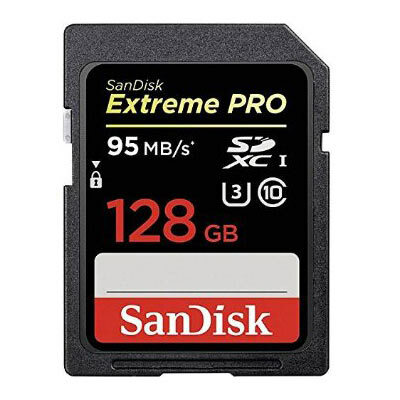 With write speeds up to 90 MB/s (600X) and read speeds up to 95 MB/s (633X), the SanDisk 128GB Extreme Pro 95MB/Sec SDXC Card unlocks your DSLR’s potential for continuous burst-mode shooting. The super-fast 95MB/Sec transfer speed takes the wait out of your post-processing workflow. This reliable, high-capacity card is shockproof, X-ray proof, waterproof, and can function down to -13°. Never miss the moment with write speeds up to 90 MB/s (600X) and read speeds up to 95 MB/s (633X). Engineered with Ultra-High Speed (UHS-I) bus architecture, it is designed to exceed rigorous performance standards. You’ll catch all those high-resolution action shots the moment they happen. 4K Ultra HD (3840 x 2160p) video provides exceptional clarity but capturing it without interruption requires significantly greater speed and storage capacity than previous generations of imaging cards provide. 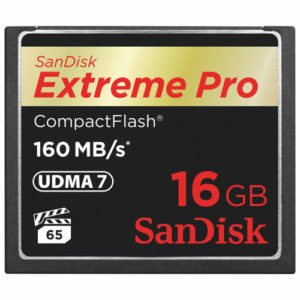 This powerful UHS-I memory card yet delivers write speeds up to 90 MB/s1 UHS Speed Class 3 (U3) recording speed for high resolution, real-world colour and stutter-free 4K Ultra HD video from your DSLR, advanced digital or HD video camera. The card’s built-in Advanced Wear Levelling and Error Correction Code engine enhances endurance and reliability.